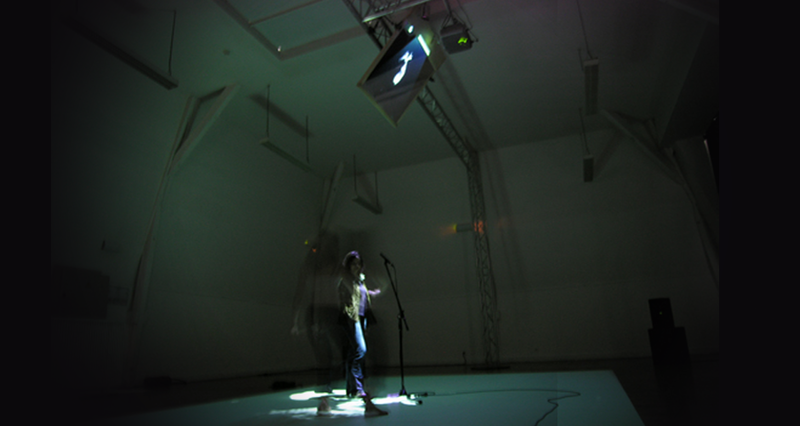 Feedback Room is an Interactive Installation. Surrounded by a white blinking light, a microphone is placed on a stand, at the center of a complete dark room. As the visitors enter the room, bold and saturated feedbacks began to appear, reacting to their slightest movements, and increasing strongly as they approach the microphone. Each gesture modulates the sound, provoking for the visitors an increasing perception of their own body, as well as the sensation that a dangerous living thing is haunting the stage. The only visible forms are white, vibrating and pixellized shadows projected on the floor, around the microphone and around every spectator getting in the space. These pixelated forms are the negative shapes of the visitor’s camera caption from the ceiling: literally, they are the generators of the sound. In this dark electric atmosphere that evokes punk music and science fiction, the visitors become both the instigators and the “willing victims” of a wild phenomenon that eludes them: a paradoxal situation of fear, self-exhibition and play.